About six months ago, I started experimenting with making my own bars of soap. Some pictures from my earlier experiments are on my soap-making project page. I’ve had both good and mediocre results. I’ve tried a few different soap “recipes”. Currently, most of the soaps I’ve been crafting begin with a glycerine, shea butter or olive oil base. 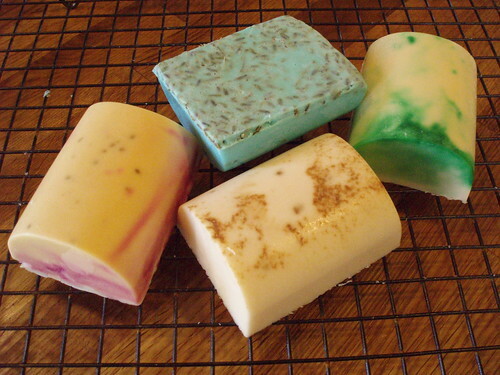 Of those I’ve made, I think I like the olive oil-based soaps best. They lather pretty good in the shower, moisturize the skin and are longer lasting. Some of the essential oils I’ve used so far are: lemongrass, sandlewood, lavender, vanilla, orange and coconut. I like the first three best, either alone or combined. Things start getting a little more interesting when you start including additives like chamomile and lemongrass leaves along with soap coloring. We’ll see how this soap works in practice. I think my next soap will be an olive oil-based lemongrass and sandelwood combination. Maybe I’ll throw some oatmeal in there too. Why not? Throw caution to the wind – that’s what I say!